A RARE FIND...A TRUE MOTHER-IN-LAW SUITE WITH SEPARATE ENTRANCE. This Custom built, stunning and elegant executive home sits on 1/2 acre with no deed restrictions. The main home has 3 bedrooms + office/gym + home theater with wet bar, fridge & over $12k in equipment, 2.5 bathrooms, 3-car garage. Gourmet eat-in kitchen w/ huge walk-in pantry, beautiful granite counters. 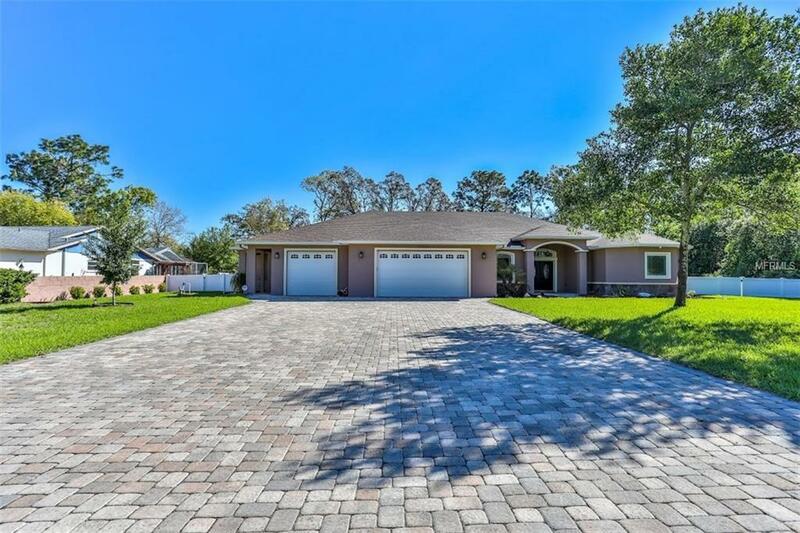 Hardwood and tile throughout, walk in closets in all bedrooms, sprinklers on well, tray ceilings, fenced w/dog run, alarm w/full camera system, shed, fireplace, extended paver driveway, covered paver lanai. IN-LAW/APT w/1,000 sq ft of living area, separate entrance, 1 large bedroom, 1 bath, full kitchen, laundry/pantry combo, granite counters, tile throughout, walk-in closets, central vac that runs through both the main house and in law suite. Conveniently located close to the expressway for easy commute to Tampa, shopping and schools. Ask agent for full list of features.